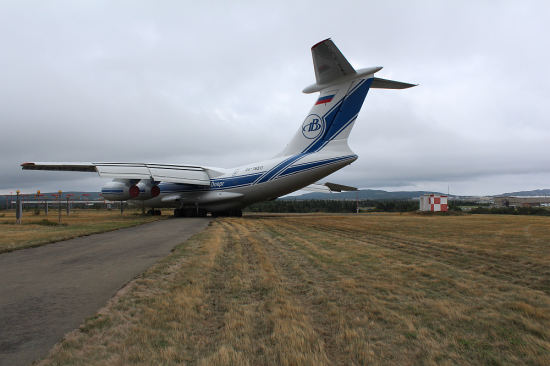 The Transportation Safety Board of Canada (TSB) released its investigation report into the August 2012 runway overrun of a Volga-Dnepr Airlines aircraft in St. John’s, Newfoundland and Labrador. On 13 August 2012, an Ilyushin IL-76TD-90VD, departed Prestwick, Scotland, for St. John’s International Airport, with 10 crew members on board. Following touchdown on runway 11, the crew was unable to stop the aircraft prior to the end of the runway. The aircraft came to rest in the grass, with the nose wheel approximately 640 feet (195 m) beyond the end of the runway surface. There were no injuries, and aircraft damage was limited to cuts and localized rubber melting on the main landing gear tires. The investigation found that a combination of factors contributed to the runway overrun. The tail wind and insufficient reduction of engine power on landing resulted in a longer than normal touchdown on the runway. The excessive tread wear on all 16 main landing gear tires and a wet runway resulted in hydroplaning, which reduced effective braking capability. An incorrect brake line installation further reduced the aircraft’s braking capability, thereby increasing the distance required to stop the aircraft. Following the occurrence, the St. John’s International Airport Authority performed texture improvement work on runways 11/29 and 16/34 using specialized equipment to improve friction. Volga-Dnepr Airlines is working with Tashkent Aircraft Production Company to resolve the discrepancy in the brake line installation. The airline also introduced requirements that flight crews monitor the heading and wind speed and that a go-around be carried out whenever the tail wind limitations have been exceeded. It also requires the captain to decide on using reverse thrust on all 4 engines in special cases.